Known as the bible of biomedical engineering, The Biomedical Engineering Handbook, Fourth Edition, sets the standard against which all other references of this nature are measured. As such, it has served as a major resource for both skilled professionals and novices to biomedical engineering. 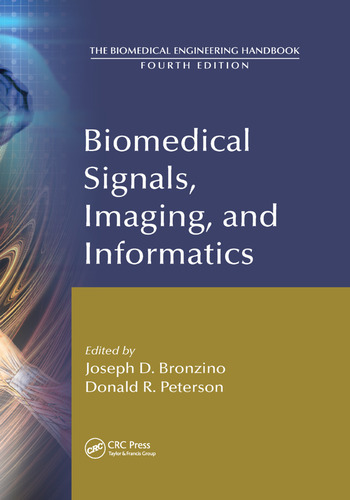 Biomedical Signals, Imaging, and Informatics, the third volume of the handbook, presents material from respected scientists with diverse backgrounds in biosignal processing, medical imaging, infrared imaging, and medical informatics. More than three dozen specific topics are examined, including biomedical signal acquisition, thermographs, infrared cameras, mammography, computed tomography, positron-emission tomography, magnetic resonance imaging, hospital information systems, and computer-based patient records. The material is presented in a systematic manner and has been updated to reflect the latest applications and research findings. Joseph D. Bronzino is the founder and president of the Biomedical Engineering Alliance and Consortium (BEACON) in Hartford, Connecticut. He earned a PhD in electrical engineering from Worcester Polytechnic Institute in Massachusetts. Dr. Bronzino has received the Millennium Award from IEEE/EMBS and the Goddard Award from Worcester Polytechnic Institute for Professional Achievement. He is the author of more than 200 articles and 11 books. Donald R. Peterson is a professor of engineering and dean of the College of Science, Technology, Engineering, Mathematics, and Nursing at Texas A&M University–Texarkana. He earned a PhD in biomedical engineering from Worcester Polytechnic Institute in Massachusetts. Dr. Peterson’s recent research focuses on measuring and modeling human, organ, and/or cell performance, including exposures to various physical stimuli and the subsequent biological responses. Dr. Peterson has published more than 50 journal articles and 12 reference books.